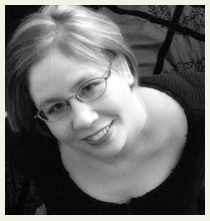 Today is the official release day for The Vespertine by Saundra Mitchell. The Vespertine has been our Reading Clean Spotlight, so I'm really excited for the release and can't wait to hold that hardcover, beautiful copy in my hands! Today, we're really happy to bring you an interview with Saundra Mitchell, and announce the winner of the Reading Clean Spotlight giveaway! Describe The Vespertine in 5 words. American elementals collide in Baltimore. I really love history. When I was very little, I wanted to be an archaeologist. Now that I'm grown, one of my favorite pastimes is reading about past times. We're all connected; the very place you stand right now has a thousand moments in history that occurred there. You're part of that- isn't that amazing? Plus, I wanted the challenge of taking a very 19th century novel form- gothic fiction- and twisting it to reflect the past, but to satisfy readers of the present. There's so much to love about gothic fiction. It's an exciting opportunity to examine people and their relationships, but to also splash around in deep, dramatic waters. I love that you can have one random ghost in a gothic novel, and all the rest is melodrama and manners. Did you decide to write another YA novel, then come up with the idea? Or did the idea come first? I knew the next book would be YA, because that's what I write! The original seed of an idea was "A girl who can see the future in the sunset." But I played with it a lot- it was set in present-day southern Indiana for a while, then a boarding school in New England. It took a lot of experimenting to figure out where that story would blossom. Ultimately, it was Baltimore 1889- once I moved everything there, the book took off! Which character did you enjoy writing about the most and why? This book was so different than Shadowed Summer. Was the writing experience different as well? In every single way. Shadowed Summer was very hard to write. The characters weren't forthcoming, they were very stubborn, and it was very much a story about everyday tragedies. It was a hot, emotionally exhausting book, and I sweltered through writing it and revising it over the course of almost seven years. Conversely, The Vespertine was a spark- as soon as I figured out when the story belonged, I tore through the drafting. Shadowed Summer was a book I had to meticulously unearth. The Vespertine was a book I had to chase down and leash! I loved this book so much! I can't wait for the companion, The Springsweet. Will we see any of the people from The Vespertine return, or is it a whole new cast of characters? I don't want to spoil anything , but I can say The Springsweet is a whole new, standalone story. It's set in Oklahoma Territory, 1890- and one character we know from The Vespertine will be at the center of it all. Thanks so much, Saundra, for taking the time to answer these questions! And thanks for offering a copy of The Vespertine and swag for our giveaway! Speaking of our giveaway.....it's time to pick winners!! Congratulations!! You will be contacted through email and Saundra is sending out the prizes. If you didn't win, you can go out and get The Vespertine TODAY!! Or, you can order it online! ! You can find my review here. Good luck to Saundra, and congratulations on your release! This book sounds very interesting, and I'm eager to get my hands on a copy. I thought it was interesting that Ms. Sauntra Mitchell spent 7 years to write and revise Shadowed Summer. I guess I always thought writers had some magic ability to always crank out novels in 365 days or less. Stubborn characters aside, I'm curious what other hurdles drew out the writing process. This is one of the best interviews I've read, so insightful. The Vespertine sounds fantastic. What a gorgeous cover, too! 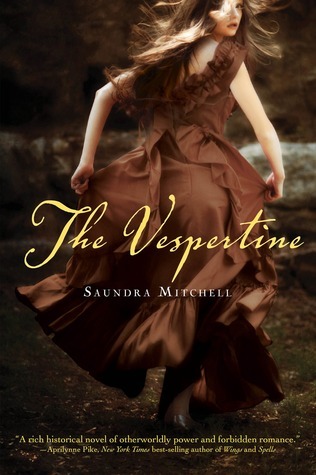 I'm really excited to read The Vespertine and knowing it was such an easy coming story for Saundra Mitchell just makes me more eager!